2019 Aides to Grand Marshal Dr. Brian J. O’Dwyer, Esq. Therese Byrne Meyer has shattered the “shamrock ceiling” in Orange County, N.Y., becoming the first woman in the New York suburb elected as an Aide to the Grand Marshal of the New York City St. Patrick’s Day Parade. “I think I had five hours of sleep last night. I couldn’t believe it was finally happening, that the Ladies Ancient Order of Hibernians is finally being recognized for what they do!” a jubilant “Terry” Meyer said at the recent Reception for the Grand Marshal and the Aides in Queens, NY. Despite a recently-broken leg, she plans to walk the Parade route up Fifth Avenue, from 44th Street to 79th Street. Mrs. Meyer was born in County Cork, raised in Orange County and is a resident of Middletown, about 75 miles from midtown Manhattan. 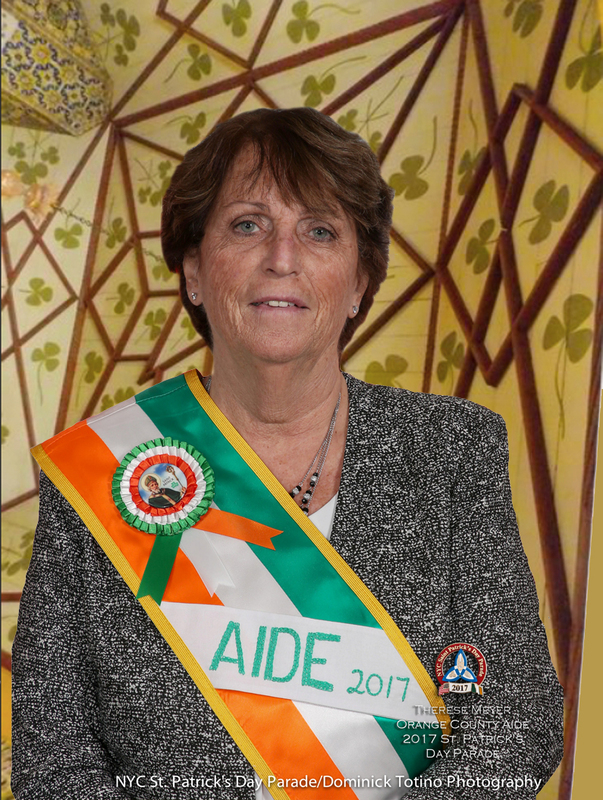 She is the President of the Ladies Ancient Order of Hibernians Orange County Board, a sisterhood devoted to charitable works and promoting Irish culture. She is also the first Orange County member elected to the New York State Ladies Ancient Order of Hibernians Board. Ladies AOH membership is open to any adult woman who is Irish by birth or descent, a practicing Catholic, or related by marriage or birth to a member of the all-male Ancient Order of Hibernians or to a Ladies AOH member. Being elected as an Aide to the Grand Marshal of the New York City St. Patrick’s Day Parade is the honor of a lifetime. This year’s 15 Aides have been chosen for their many years of charitable work and service to the Irish and Irish-American communities in the Metropolitan Area. When asked why this honor was so long overdue, Mrs. Meyer diplomatically said, “Times have changed.” She praised the young men who are now AOH leaders, “who were raised by working mothers and have working wives,” for recognizing the Ladies AOH and respecting their contributions. A small business owner, Mrs. Meyer’s resume includes starting the Orange County LAOH Special Fund in 2014 to help members who have fallen on hard times. She also started the Orange County Ladies AOH Christmas Dinner; in 2002, an annual fundraiser which has benefitted local families, the Hudson Valley Food Bank, and other local charities. “I have a passion to give back,” she said. “People need to help each other.” Mrs. Meyer,who is a cancer survivor, currently serves on the American Cancer Society Board of Advisers and spent ten years as the volunteer chairperson for the Goshen, N.Y. “Relay for Life,” the society’s signature fundraiser. Mrs. Meyer is a community chairperson of development to expand “Relay for Life” events and the lead organizer of the Orange County “Bark for Life,” a cancer fundraising event honoring canine companions. The unstoppable Mrs. Meyer also raises funds for St. Jude Children’s Research Hospital, which treats children with cancer. She’s an active parishioner of Our Lady of Mount Carmel Church in Middletown, N.Y., a member of the Lions Club, past president of the Town of Wallkill club, and spent years as a volunteer for the Irish Heritage Festival in Orange County, N.Y.
For most of its 257 years, the New York City St. Patrick’s Day Parade’s volunteer organizers, workers, and most of its marchers have been men. The Parade had been run by the AOH until 1993, when the AOH relinquished control of the Parade to the independent St. Patrick’s Day Parade Board of Directors that runs it today. Most of the Aides to the Parade’s Grand Marshal are recommended to the Board of Directors by AOH officials. The door began to open for women in 1989, when Irish radio talk-show host Dorothy Hayden Cudahy was elected the first woman Grand Marshal to lead the New York City St. Patrick’s Day Parade up Fifth Avenue. Irish language advocate and educator Mary Holt Moore, who had lobbied for a woman Parade Grand Marshal for more than a decade, was given the honor in 1991, followed in 1999 by actress Maureen O’Hara and in 2011 by author Mary Higgins Clark. During the 1990’s female Aides to the Parade’s Grand Marshal slowly started being honored. The Ladies AOH began as the “Daughters of Erin” in 1894 in Omaha, Nebraska, to help immigrant Irish women find shelter and jobs and maintain their culture. As an auxiliary to the men’s group, its organization and activities were subject to the approval of AOH officers for nearly 110 years, according to the Ladies AOH New York State website. The “Ladies Ancient Order of Hibernians” declared its independence in 2004, incorporating in New York State as a separate legal organization. The groups share a motto of “Friendship, Unity, and Christian Charity,” but old prejudices die hard. Some entrenched AOH officials have been slow to share the honor of being an Aide with the Ladies AOH. When asked what had inspired her to break Orange County’s “shamrock ceiling,” Mrs. Meyer was philosophical. “Someone has to take the first step. I’m willing stand up for what’s right.” She credits her father, Edwin J. Byrne, for teaching her to have the courage of her convictions. She recalled his advice that “you never walk behind a man, you either walk in front of him or next to him.” Mrs. Meyer and her husband Ken have repeated that to their two adult daughters, Megan Caitlin and Taylor Kathleen. For further information about the Parade, please visit NYCStPatricksParade.Org or contact the Parade office at PO Box 295 Woodlawn Station, Bronx, NY 10470, Telephone 718-231- 4400. Help support the world's oldest and largest Parade. Please note: The 2019 New York City Saint Patrick's Day Parade® will be held on Saturday, March 16. 2019 Parade Pins Are In! Order Yours Now!